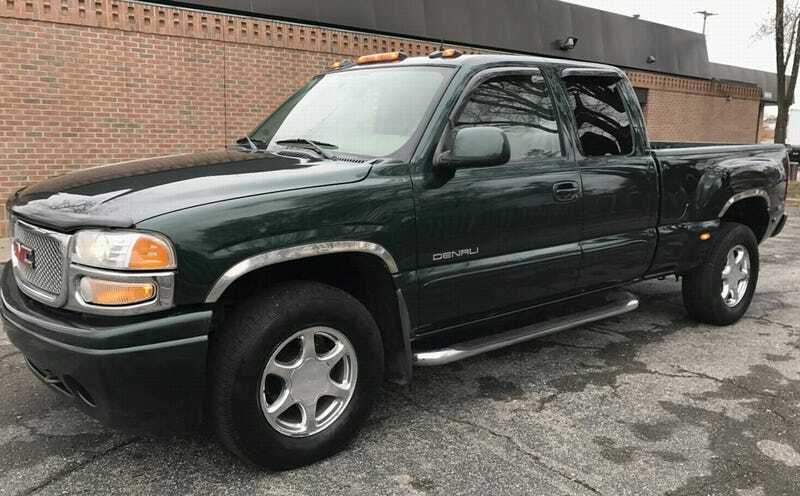 For $5,800, Could This 2004 GMC Denali Steer You Wrong? Today’s Nice Price or Crack Pipe GMC has four-wheel steering. That should be sure you get where you’re going, no matter which end is leading the way. We’ll just have to decide if its price elicits a way to go! too. I seemingly couldn’t muster among you as much enthusiasm as I felt for yesterday’s JDM 1990 Toyota Lite Ace Camp Mate. That was despite it’s having a five on the tree and a shower. The realities of a grey market car—especially one ill-suited for playing road games here in the States—sadly overwhelmed those fabulous features. In the end, the price was deemed overwhelming too, and at a little over twelve grand it fell in a 68% Crack Pipe loss. Quick quiz time: how many different cars have been sold around the globe with active four-wheel steering? A lot, right? Nissan was big on that for a while, as was once Mazda, Mitsubishi, and Honda. Hell, even the Toyota Camry at one time offered 4WS as option. Here we have another four-wheel steerer—a 2004 GMC Denali with Quadrasteer. These were based on the Sierra pickup truck and offered both the luxury accommodations of the Denali package and the tight turning radius of a unicycle. Okay, so it’s quite not that tight, but the Quadrasteer system does reduce the truck’s turning circle by over ten feet, cutting it to 37 feet, or just more than that of a compact car. That’s a big deal if you’re into towing boats or like making petite donuts in the parking lot. The system is electric and computer controlled. A dash-mounted button allows you to switch between three different steering modes—two-wheel, four-wheel, and four-wheel tow—and the angle of the dangle for each is speed-dependent. As cool as it was, not too many people saw the merits in the system. Or maybe they didn’t see those merits as being worth the four-grand it initially took to check that particular option box. This black forest green over grey Denali is one truck so imbued, as evidenced by its bumped-out fiberglass fenders in back and the fact that the ad says so. Powering the Denali is a 325-horsepower/370 lb-ft 6-litre V8 and behind that is a four-speed automatic that the seller says is smooth shifting. The Denali package adds a ton of niceties to the truck, things like heated seats, leather, and full carpet so it should impress the in-laws too. This bad boy is an extended cab too, meaning you bring some friends long for the ride so they can also experience the wonders of four-wheel steering. Lights and what looks to be a class III/IV hitch mean it’s ready to tow whatcha got. On the downside, the truck rocks an impressive albeit somewhat alarming 223,000 miles. Over the course of that distance the NAV screen has apparently given up the ghost, there’s some wear in the driver’s seat squab, and the rear bumper has started to make its way back to its base elements. Other than that, it all looks pretty good, plus it’ll probably turn on a dime. You’ll need more than a dime to buy this all-wheel dancing truck, $5,800 to be exact. What’s your take on that price for this rare bit of GM/Delphi technology wrapped in a luxo-truck? Does that seem like a fair deal to spin me right round baby, right round like a record? Or, do you think that price couldn’t turn you if it tried? Grand Rapids MI Craigslist, or go here if the ad disappears. For $12,450, Could This 1990 Toyota Lite Ace Really Be Your Camp Mate?